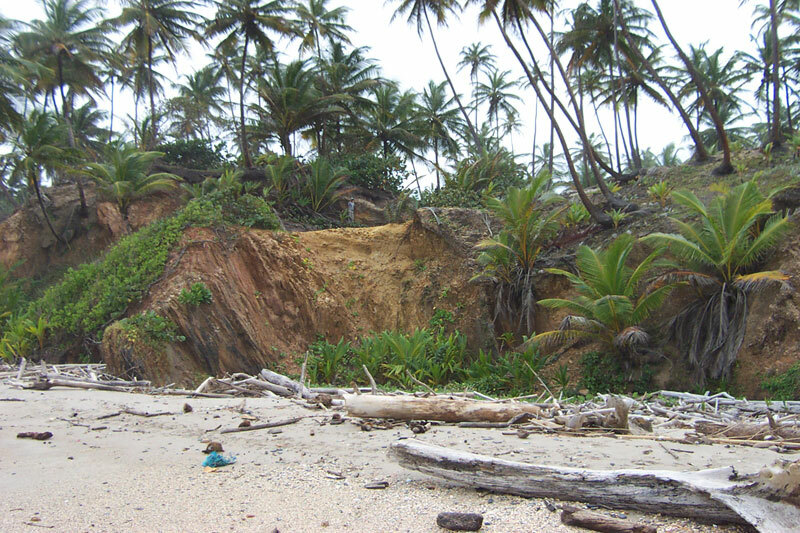 Trinidad, West Indies, has many beautiful beaches (IMA, 2013), and among the most interesting are those of the Northern Trinidad coast. Along the coast an east-west range of mountains, the Northern Range, emerges from the sea to peaks over 900 m in elevation (Fig. 1). The shoreline of sea cliffs and rocky headlands is punctuated by both pocket beaches and short linear beaches associated with small river mouths. 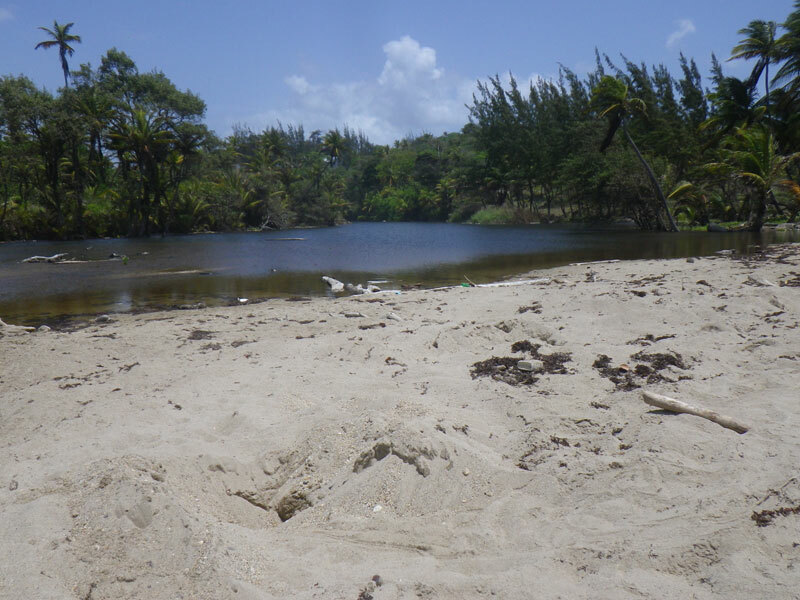 Tompire Beach, a particularly spectacular linear beach, is located along the northeast coast, near the village of Redhead (Cumana), off of Toco Main Road (Fig. 1, inset). Tompire Beach, and the uniqueness of the geology of the Northern Range, have drawn the senior author to this location several times over the last 25 years. Here, an ancient beach has been uplifted out of the sea and is now perched ~20 m above the modern sands of Tompire Beach(Fig. 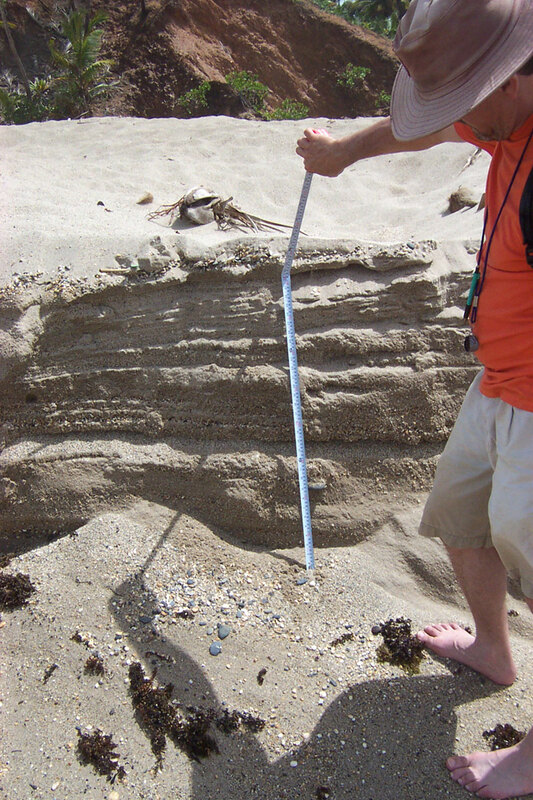 2).The preservation of this feature presents a unique opportunity to compare factors that shape the beach and, in turn, how an ancient beach can serve as direct markers for dynamic change. The present beach is a gentle arcuate strip extending north from Pt. Playa to another rock headland, a little over 0.8 km in length with the mouth of the Tompire River located about midway along the beach. At the mouth of the Tompire River the beach forms a spit-like emergent sand bar across the river mouth (Fig. 3). The river mouth is sometimes closed in the dry season, but then breaks through to form its ocean outlet in the wet season. During storms the barrier bar is overwashed by waves and beach sand is transported across the bar into the lagoon. The rugged shoreline has evolved under the influence of several factors. The spectacular rock structures exposed in the sea cliffs attest to ancient mountain building, and uplift in more recent time. The latter resulted in the raised marine terrace, capped by the fossil beach. This wave-cut platform stands about 20 m (>65 ft) above the present beach and modern-day sea level (Figs. 2 and 4), and has been cultivated for copra (dried coconut) production. 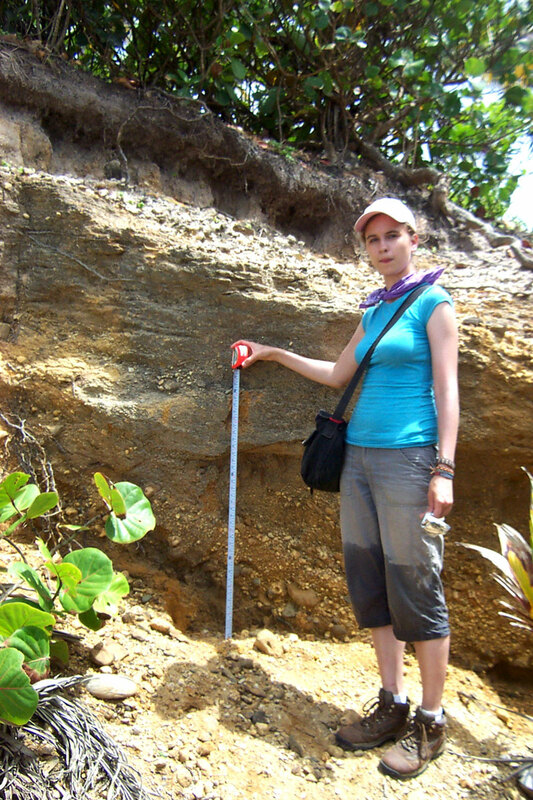 The “two beaches” provide an opportunity to compare the modern and ancient deposits. For example, the internal structures (e.g., laminae and bedding) are similar (Figs. 5 and 6). Modern Tompire Beach is a pebbly to coarse sandy beach, with abundant metamorphic rock fragments. Generally, the pebbles with abundant quartz veins are the ones that survive the vigorous attack by the strong Atlantic waves. The ancient beach is of similar composition, differing mainly in the sediments’ brown color due to staining by groundwater (Figs. 2 and 6). This ancient beach deposit has been recently dated at about 30,000 years old, using OSL (optically stimulated luminescence) (Arkle et al., 2015). On a regional scale, imagine the island of Trinidad rolling on a north-south axis with the western side sinking and the eastern side rising. In a broad sense, western Trinidad is submergent, while the eastern side is emergent. 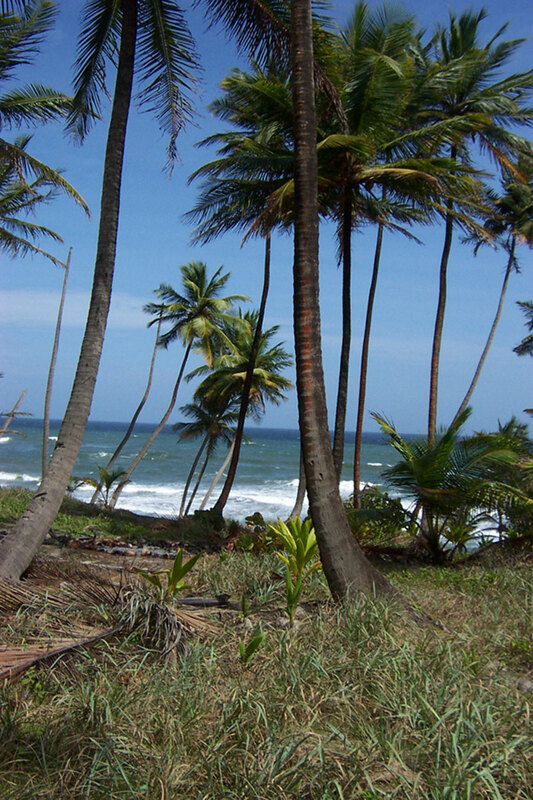 The western coast of Trinidad is heavily embayed, characterized, in part, by extensive shorelines of mangrove swamps, and fewer beaches. 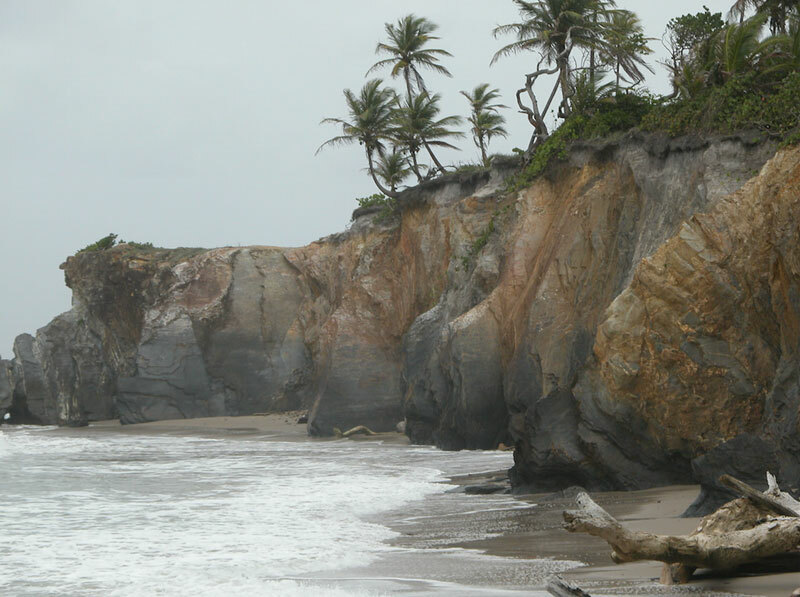 The climate is dryer, less windy, and faces the Caribbean Sea and Gulf of Paria; areas of lower wave energy. The submergent pattern is also apparent along the north coast where pocket beaches become more pronounced and abundant to the west where tectonic sinking is greater (Fig. 1). Technically, this relative sinking versus rising is related to Plate Tectonics, driven by right-lateral transform tectonics at a pull-apart step-over, and/or over a deep lithospheric tear that is propagating eastward (Weber et al. 2010). A second factor in the shaping of the emergent northeastern shore is that the eastern end of the Northern Range faces head-on into the strong easterly trade winds which generate an almost constant swell which, together with storms, generates a high-energy wave regime from the western Atlantic Ocean. Although the tidal range is not great, many of the narrow beaches are submerged at high tide, and waves are a dominant erosional force. This setting also results in a different climate than that of the western parts of the island. The annual rain fall (~5 m/yr) is much higher, and the land is covered in dense and lush tropical vegetation. The higher runoff is reflected in small rivers and streams coming down to the shore, and usually marked by somewhat more robust beach development. Local geology also is a factor in that the folded rocks of varied composition erode at different rates, producing an irregular shoreline of varied elevation. Tompire Bay’s beach is an example of the latter (Fig. 7). The northeast coast of Trinidad, including Tompire Bay, is a nesting ground for endangered leatherback sea turtles (Dermochelys coriacea). Programs instituted some years ago appear to be working as there has been a resurgence in the number of nesting turtles in the last few years. During nesting season Tompire Beach is patrolled at night for nest protection. In 2011, unusual, thick accumulations of Sargassum seaweed on the beaches in the Eastern Caribbean were noted, and again in 2014. 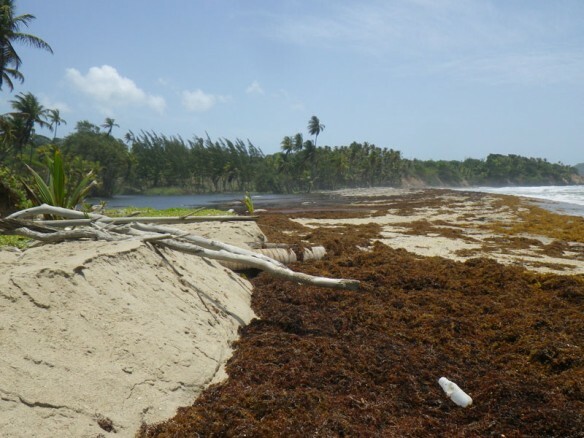 (See “Why is so much brown seaweed washing ashore?” Guardian and “A different look at Sargassum seaweed;” The Trinidad Express). 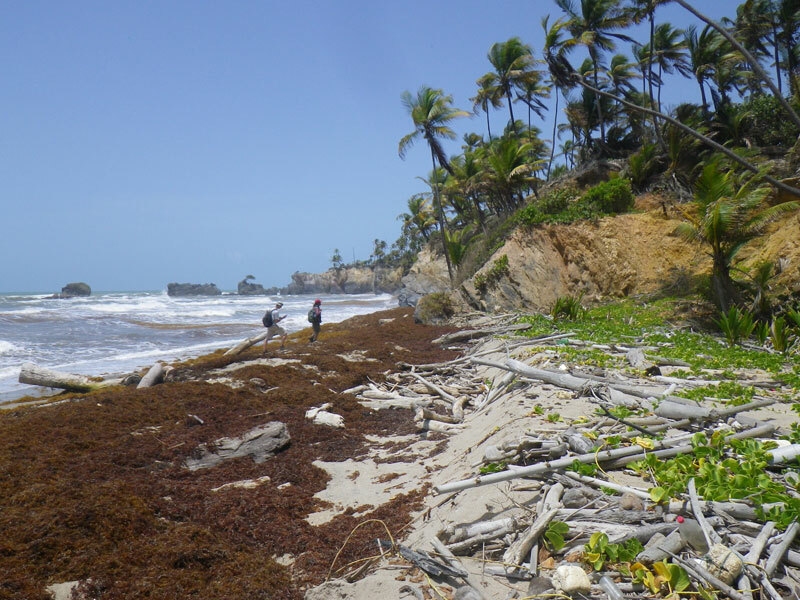 These massive amounts of seaweed are thought to be occurring because the range of areas in which the plant grows has increased, and is now growing where it can be picked up by currents in the western Atlantic and eastern Caribbean and carried to these islands. 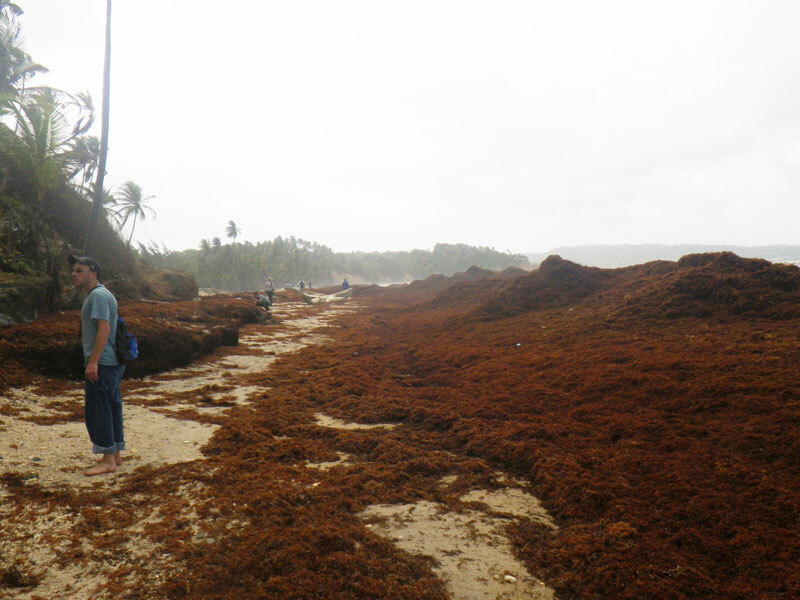 There is a preliminary suggestion that the change may be due to global warming which is a strong possibility as Sargassum needs nutrients and high water temperatures. Perhaps warming of the tropical ocean is changing habitats. During the summer of 2015, large amounts of the seaweed were accumulating on Tompire Beach as massive wrack lines (Figs. 8, 9, and 10). Wrack lines are common on this beach, and the accumulations of drift wood at the back of the beach attest to the highest levels reached by storm waves (Fig. 8), however, the massive amounts of seaweed is a new phenomenon. 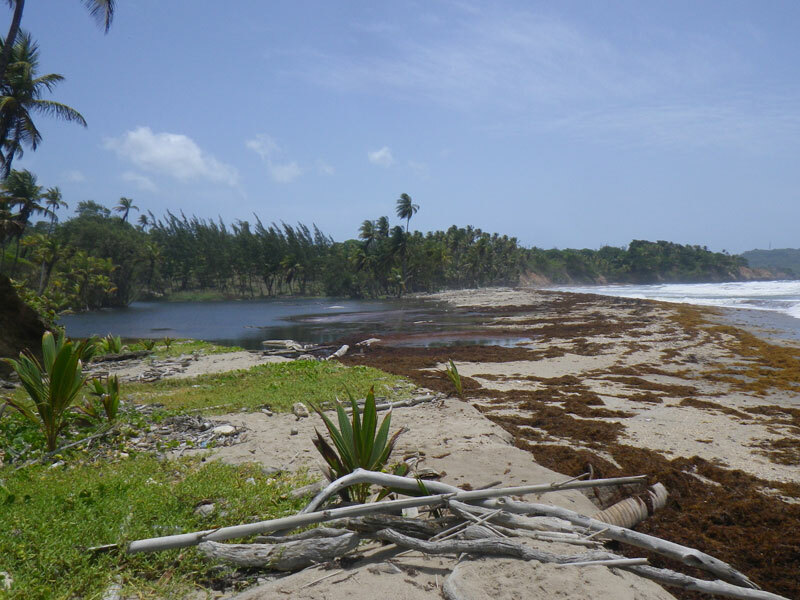 The width of the continuous Sargassum wrack line, and its thickness (up to 2 m+) interfered with the turtles’ access to the beach. (Figs. 9 and 10) The sea turtles were forced to travel and nest up river on its sandy banks and on the back side of the barrier bar (Fig. 11). The back-beach sea cliff has some of the best rock exposures in the region, kept bare by wave action and mass wasting (Figs. 7 and 12). The spectacular folds (anticlines and synclines) are obvious even to the non-geologist. Three generations of folds and faults have been documented and studied in detail by Weber and Ferrill (2002). The dominant rock types are meta-sedimentary slates and meta-sandstones. These rocks have Mesozoic depositional ages and Cenozoic metamorphic ages (Weber et al. 2001). The composition of the present quarzites and slates, cut by veins of quartz, reflect the original sedimentary rocks that were shales and quartz sandstones. These rocks are the immediate sources for the beach sediment (Figs. 5 and 12), as well as material flushed down the Tompire River. The unique juxtaposition of a modern beach and the preservation of it’s older counterpart perched above, not only make for a beautiful remote setting, but retains an archive of the dynamic environment that shaped them both. Change is the rule, yet the physical conditions that shaped the two beaches are similar. The mountains evolved, the beaches have evolved. Natural change is the rule. But like the turtles, we must cope with such change without altering the natural habitat. Arkle, J.C., Owen, L.A., Weber, J., Moonan, M., and Enkelmann, E., 2015, Late Neogene-Recent Evolution of the Northern Range, Trinidad, presented at 2015 Meeting, Caribbean Geological Conference, Port of Spain, Trinidad, 17-21 May. Institute of Marine Affairs, 2013, A Guide to the Beaches and Bays of Trinidad and Tobago: Institute of Marine Affairs, Chaguaramus, Trinidad, West Indies, 113p. 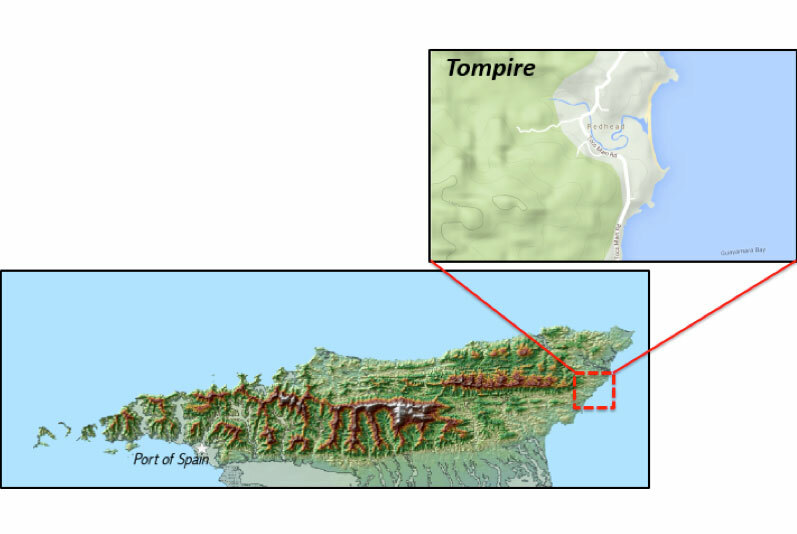 Weber, J., Saleh, J., Balkaransingh, S., Dixon, T., Ambeh, W., Leong, T., Rodriguez, A., and Miller, K., 2011, Triangulation-to-GPS and GPS-to-GPS geodesy in Trinidad, West Indies: Neotectonics, seismic risk, and geologic implications, Journal Petroleum and Marine Geology, v.28, p.200-211, doi:10.1016/j.marpetgeo.2009.07.010. 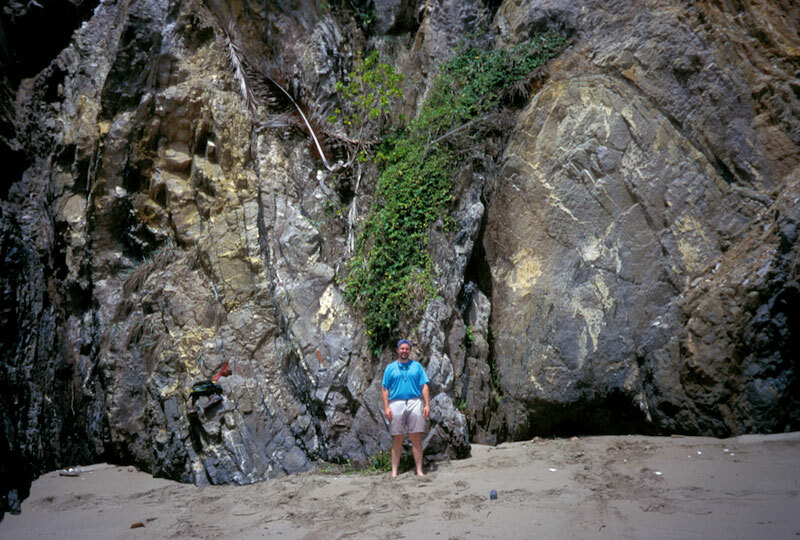 Weber, J.C. and Ferrill, D., 2002, Structural geology of the Tompire Bay outcrops, eastern Northern Range, Trinidad, in, Jackson, T. A. (Ed. ), Caribbean Geology Into the Third Millennium, 87-95, UWI Press. Weber, J.C., Dixon, T.H., DeMets, C., Ambeh, W. B., Jansma, P., Mattioli, G., Saleh, J., Sella, G., Bilham, R., and Perez, O., 2010, GPS Estimate of relative motion between the Caribbean and South American plates, and geologic implications for Trinidad and Venezuela, Geology, 29, 75-78. Weber, J.C., Ferrill, D., and Roden-Tice, M., 2001, Calcite and quartz microstructural geothermometry of low-grade metasedimentary rocks, Northern Range, Trinidad, Journal of Structural Geology, 23, 93-112.